A snapped or fractured rod is a disaster to any angler, but if you look after your rods in the first place they last for a good while, doing what they’re designed for -catching fish. To be fair, though, fishing rods are easy enough to break by accident. They are also extremely expensive items to buy, so it really is a good idea to look after them as best you can. In a way, rod responsibility is just a matter of ordinary common sense and care, but it’s definitely worth taking a close look at some of the things you can do to protect your rod and so cut down on the risk of damage before, during and after angling sessions. Classic hatchback – note the end of the rod sticking out of the boot. 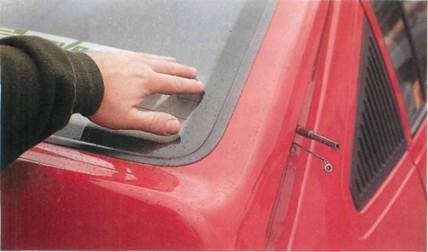 Always make sure tackle is safely stowed before slamming doors. Another way to transport rods safely is on the car roof. 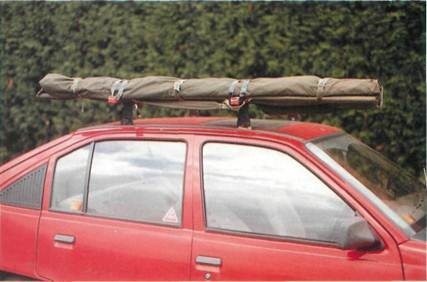 This is only safe if you secure the rods on the roof rack and check the rack is securely fastened to the car. Just as important as protecting your rods in transit is looking after them at home. This rack is handy for safe rod storage. The main thing is to find a place where rods are not likely to get in anyone’s way. Refresh your memory with a simple checklist for looking after your rod. 1. Storing rods – look for a safe place. 2. Transporting rods – in a bag or case. 3. Carrying rods – with the tip pointing behind. 4. Vehicles – make sure rods are safely packed. 5. Roof racks – must be secure, and rods well strapped down. Resting rods – don’t leave them where they might get trodden on.The choice is yours: carp quiver, roll-up holdall (middle), single rod and reel pouch . Good rod bags such as these save your delicate rods from taking a battering. This is the correct way to -.carry your rod when it’s assembled ready for fishing. Make sure the tip joints behind you at a low angle. It’s less likely to get taught in branches. If it does catch in a tree it is easier to pull out than if it vent in tip first, and it’s less likely to break too. Double indemnity – this means using a large rod holdall to carry several rods ill ready encased in protective rod tubes. Be careful how you pack gear into a car Don’t force long lengths of rod into space that aren’t designed to take them. It’s a pole-axing experience when you slam down a hatchback door on an exposed rod section Roof racks are useful for carrying rod case and bags. The crucial thing is to make sun the rods are firmly strapped to the rack ant that the rack is securely attached to the room in the first place. When confronted with obstacles such a: barbed wire fences it is often safer to unload and pass your rods over the fence firs before trying to climb over yourself. If you attempt to get over with awkward quiver; strapped on, or balancing a couple of ready assembled rods, there’s a likelihood of getting caught up, damaging the rods and ever doing yourself an injury. 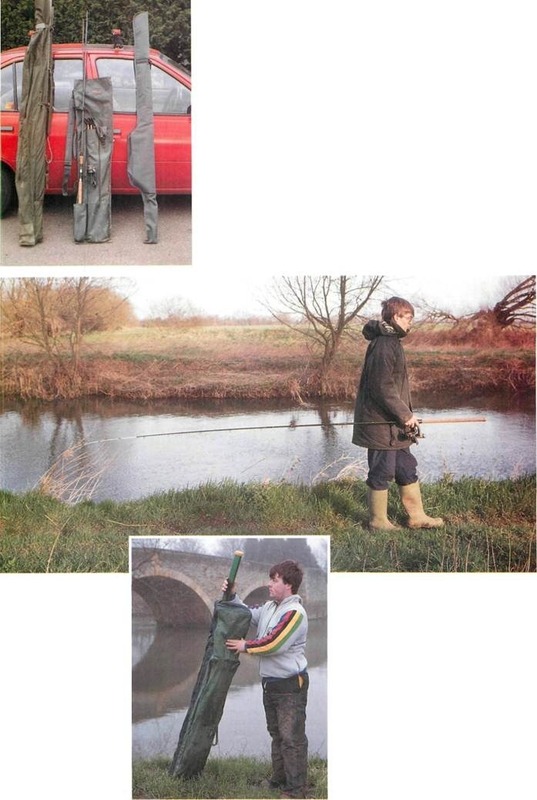 On the bank When your rod is out of its case and set up ready to fish, it is vulnerable to damage. Carry it carefully with the tip pointing behind you and downwards (you don’t want to poke someone’s eye out!). Try to avoid laying rods on the ground where they are all too easy to tread on. II you have to place them on the bank for some reason, never forget that they are there and beware of any clodhopping feet nearby If you have to rest the rods on the ground then at least try to mark them with a bright cloth or bag so that passers-by have the chance to see that something is there before they step on them! Better still, take the time to set up some extra rod rests to hole your rods safely when not in use. of protecting your rods from inevitable rough handling. At home you should keep your rods in a safe corner — well away from places where they could be knocked over or where someone could trip up on them. Wherever you store them, they’re even safer if kept in a protective bag or case. 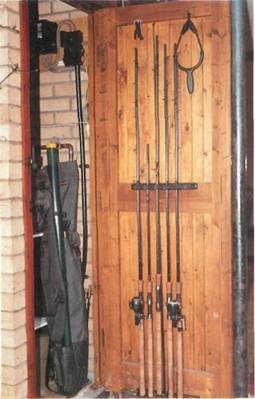 Guard your gear — and save space – by making a rod rack or clips to keep rods attached to a wall or the back of a door. In transit When you’re on the move carrying rods to the water or transporting them in a car or on a bike, they are in danger of taking a few knocks. Again a bag, box or case is the best kind of protection.